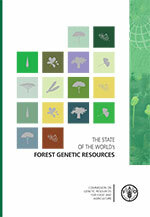 These country reports are prepared as a contribution to the FAO publication, The Report on the State of the World’s Forest Genetic Resources. The content and the structure are in accordance with the recommendations and guidelines given by FAO in the document Guidelines for Preparation of Country Reports for the State of the World’s Forest Genetic Resources (2010). These reports were submitted to FAO as official government documents. The report is presented on www.fao.org/documents as supportive and contextual information to be used in conjunction with other documentation on world forest genetic resources. The content and the views expressed in these reports are the responsibility of the entity submitting the report to FAO. FAO may not be held responsible for the use which may be made of the information contained in these reports.